“Stacy, thank you again for showing us, namely with the Jac series, or your blog in general (thinking Newt and the box, among other things) how progress is an incremental process, that can go through thousands of baby steps. We’d all want progress to be leaps and bounds, but while there will be a major breakthrough once in a while, we must learn to recognize and build on the minor, sometimes minute ones, because they are the steps to success, all the same. Failing to identify tries and offers from the horse actually impairs his learning process. We have to be steady, demanding, but rewarding, and above all, patient. And you embody that better than anyone. Thank you so much for being an inspiration, mine anyway.”-Claire D.
I love knowing that people ‘get it’ and understand that the best and most thorough horse training takes time. I often find myself struggling with remembering the importance of ‘all the little steps’ with my own children and their training. It is so tempting while I home school them to make everything about the final school testing. This temptation is seen in the horse world with people rushing horses to get ready for the ‘test’ which could be a horse show, a parade, or a big weekend trail ride. None of these are bad end goals but the methods used to achieve them is important. 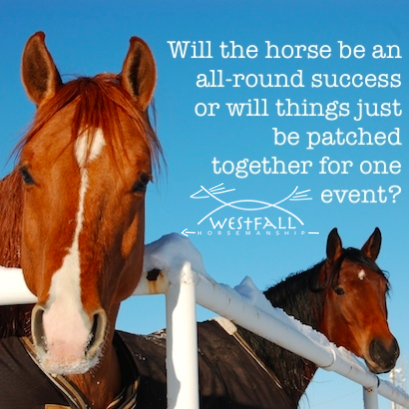 Will the horse be an all-round success or will things just be patched together for that one event? Is it more important for my kids to be well rounded human beings or to test well at the end of the year? The great news is we can have both…but they must be in the correct order. Stacy’s Youtube Channel is where you can find her videos including Newt and the box and Stacy’s Video Diary: Jac. ← How can you prepare a horse for being ridden in a dress? Stacy, I am so thrilled that my remark inspired you this blog entry. I wrote this this morning after a truly great session with my coach last Sunday, yet today’s session was very average at best, almost mediocre at times. And you know what ? it’s alright ! Today I was the weakest link in our pair because I expected my horse to be just as great as last Sunday, yet I -unvoluntarily, of course- set him up for failure in several ways. I’m trying to focus on the few goods things he offered today, and will do my best to get more and better tomorrow.